We are bringing you a Mad Meat Genius first; dried beef. This was spotted at Las Montanas Supermarket. I saw it on the shelf and walked right by. I got to the next aisle and stopped dead in my tracks. Dried beef? I had to investigate. The clerk explained it was used with eggs for a breakfast dish. A small amount was purchased. Once home a little more digging on the World Wide Web produced information and recipes. Carne Machaca is a form of beef jerky. Meat is marinated, cooked, shredded and then dried. 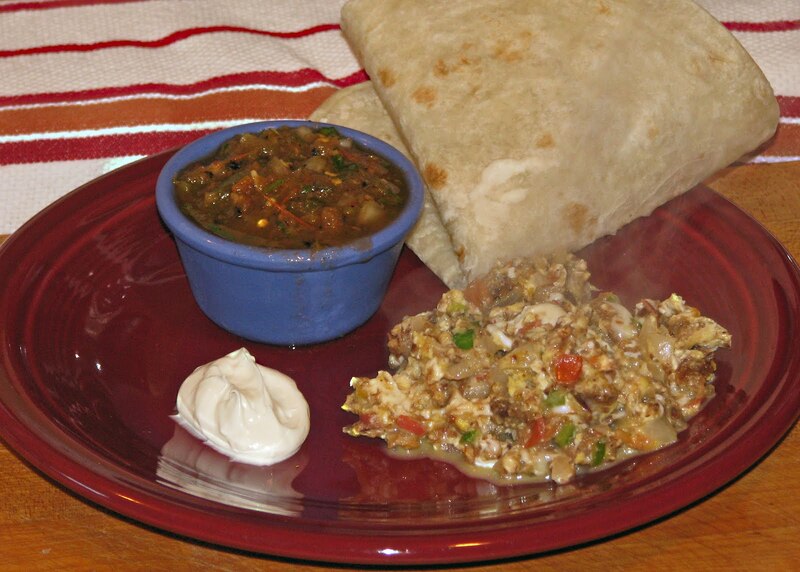 It is usually sautéed with salsa and eggs to make the filling for a spicy breakfast burrito. We are home and opened our container of dried beef. Ms. Goofy and I both took a whiff. We both simultaneously exclaimed it smells like dog food. The odor was very off putting. In the name of research we continued. Chopped onion, tomato and a Serrano pepper were cooked in a little olive oil for several minutes. The dried beef was added and cooked for several more minutes. Eggs were added and cooked. This mixture was served with salsa and a tortilla. The dried beef was on the salty side. A little chewy with beef flavor was the verdict. It tasted fine enough, but the smell was still in the back of our mind. This is an experiment that will not be repeated. My wife's grandfather used to make SOS with dried beef. It was great. I suppose if you put enough white sauce anything and it will taste good. Greg, I have had SOS and loved it too. This dried beef just did not smell good. I do not know if we got a bad batch or what. Thanks for being the Guinea Pig on this one. Is this like "chipped beef?" My mother used to serve creamed chipped beef from time to time but I have no memory of how she made it. Well, we're glad you tried, so we don't have to. I'll admit, I would have bought some too. No, maybe not. Yeah, like Lea Ann said, thanks for taking one for "the team". LeaAnn, What would Elway say? Cookiecrumb, That the way we like it, funky and nasty. Chris, You big old Green Egg person. Fly down to Lake Havasu next weekend and say Hello. The dish is called 'Machaca con Huevos.' It's a basic staple breakfast food all throughout Mexico but has especially been gaining traction in more populated areas like Nuevo Leon. My grandparents and mother cooked this for me all the time when I was younger. y'all did this dish really fancy and stuff which is great but FWIW all that is generally done to prepare it is you just mix some in as you cook plain scrambled eggs, but before they clump together. Cooking it in like this should remove most of it's negative aspects such as the chewiness or dryness. Ratio is largely up to your own tastes but I usually cook around 3 tablespoons per four eggs. Note that you don't necessarily have to salt or spice the eggs unless you want to, since the dried beef carries salt and spices through it's preparation. After it's prepared you can eat it plain, with salsa, pico de gallo, in a heated corn tortilla etc. The idea behind adding dried beef to scrambled eggs is to fortify with the nutrients that come from beef without negatively affecting their flavor. Nice looking dish you guys prepared though! Interesting recipe. I think I'll give it a try. Hopefully it turns out just as good. 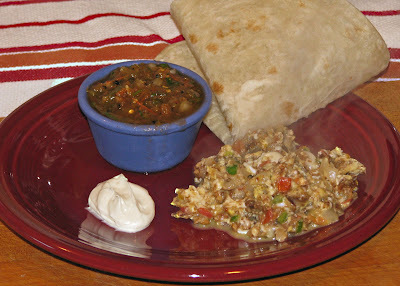 Mad Meat Genius, as fellow Machaca enthusiast, I really enjoyed your recipe and your fun blog. 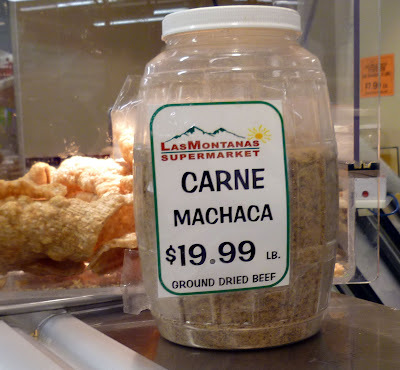 I'd like to send you, free of charge, the most addictive and authentic Machaca found in the west. also a bag of authentic dried beef. Not Jerky, but honest-to-goodness dried beef. No sugar, no soy sauces or teriyaki goo. Just trim beef, salt and pepper, slow cooked and dried. The stuff is delicious and smells great. In your area you can find the brand I am talking about, Don Pedro's Meat, in some hispanic markets. Here in So Cal is very popular in the Mexican side of town. Drop me a line at Jaramilloaf@yahoo.com and I'll send you a sample bag. Cheers and happy meat smoking.